John McN Rosebush Professorship, given by the University of Wisconsin Oshkosh. 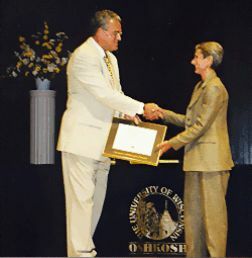 UW Oshkosh Chancellor Richard Wells presents Ava McCall with her Rosebush Award on September 4, 2001. McCall, A. L. (2017). Teaching children about the global economy: Integrating inquiry with human rights. The Social Studies, 108, 136-142. McCall, A. L. (2017). When retired and practicing teachers collaborate: Enhancing elementary social studies instruction. Social Studies and the Young Learner, 29, 13-16. McCall, A. L. (2014). When preservice teachers volunteer at a food pantry. Finding Solutions Newsletter, 19. McCall, A. L., & Vang, B. (2012). Preparing preservice teachers to meet the needs of Hmong refugee students. Multicultural Perspectives, 14, 32-37. McCall, A. L. (2011). Promoting critical thinking and inquiry through maps in elementary classrooms. The Social Studies, 103, 132-138. McCall, A. L. (2010). Teaching powerful social studies ideas through literature circles. The Social Studies, 101, 152-159. McCall, A. L. (2010). Still teaching future teachers about hunger. Finding Solutions Newsletter, 15. McCall, A. L. (2009). Preparing preservice teachers for teaching about hunger and poverty. Finding Solutions Newsletter, 14, 6-7. McCall, A. L., Janssen, B., & Riederer, K. (2008). More time for powerful social studies: When university social studies methods faculty and classroom teachers collaborate. The Social Studies, 99, 135-141. McCall, A. L. (2007). Struggles and possibilities of a feminist department chair. In R. Martin (Ed. ), Transforming the Academy: Struggles and Strategies for the Advancement of Women in Higher Education, Volume II.Tehachapi, CA: GreyMill. McCall, A. L. (2006). Supporting exemplary social studies teaching in elementary schools. The Social Studies, 97, 161-167. McCall, A. L. (2006). Enriching state studies teaching: Learning from experienced teachers. Social Studies and the Young Learner, 19, 17-22. McCall, A. L. (2005). Teachers and kids: Taking action in response to hurricane Katrina. Finding Solutions Newsletter, 10, 8. McCall, A. L. (2005). SSH! We don’t want to mention it: Resistance to addressing poverty in teaching. Finding Solutions Newsletter, 10, 5-7. McCall, A. L. (2004). Using poetry in social studies classes to teach about cultural diversity and social justice. The Social Studies, 95, 172-176. McCall, A. L. (2004). Webster Elementary School: Making a difference for children and families. Kids Can Make A Difference Newsletter, 9, 3-4. McCall, A. L. & Ristow, T. (2003). Teaching State History: A Guide To Developing A Multicultural Curriculum. Portsmouth, NH: Heinemann. McCall, A. L. (2002). Quilting across cultures: Teaching Native American, European American, and African American experiences in the United States. Social Studies & the Young Learner, 15, 20-25. McCall, A. L. (2002). That’s not fair! Fourth-graders’ responses to multicultural state history. The Social Studies, 93, 85-91. McCall, A. L., (2001). Kids can make a difference: A model for social change. Kids Can Make A Difference Newsletter, 6, 4-5. McCall, A. L. & Ristow, T. (2001). Connecting family and state histories: A teacher educator and classroom teacher collaborate. In M. Christenson, M. Johnston, & J. Norris, (Eds. ), Teaching together: School/University collaboration to improve social studies education. Washington, DC: National Council for the Social Studies. McCall, A. L. (1999). Ribbons and beads: Native American art reveals history and culture. Social Studies & the Young Learner, 12, 8-11. McCall, A. L. (1999). Speaking through cloth: Teaching Hmong history and culture through textile art. The Social Studies, 90, 230-236. McCall, A. L. (1999). Can feminist voices survive and transform the academy? In L. K. Christian-Smith & K. Keelor (Eds. ), Everyday knowledge and uncommon truths: Women of the academy. Boulder: CO: Westview. McCall, A. L. (1999). Teaching future teachers about hunger. Kids Can Make A Difference Newsletter, 4, 1-3. McCall, A. L. (1998). Cultural traditions of ancient Egypt. [Review of the books Wrapped for eternity: The story of the Egyptian mummy and Pyramids: Tombs for eternity]. Journal of Adolescent & Adult Literacy, 42, 329-331. McCall, A. L. (1998). Hmong Paj Ntaub: Using textile arts to teach young children about cultures. Social Education, 62, 294-296. McCall, A. L. (1998). Teaching by the rules, changing the rules in teacher education. In A. Cole, J. G. Knowles & R. Elijah (Eds. ), The heart of the matter: Teacher educators and teacher education reform (pp. 135-147). San Francisco: Caddo Gap. McCall, A. L. & Ford, M. P. (1998). Why not do something? Literature as a catalyst for social action. Childhood Education, 74, 130-135. McCall, A. L. & Ristow, T. (1998). Our families' stories in Wisconsin. Badger History Bulletin, 3, Elementary Level, No. 8. McCall, A. L. (1997). More than a pretty cloth: Teaching Hmong history and culture through textile art. Theory and Research in Social Education, 25, 137-166. McCall, A. L. & Andringa, A. (1997). Learning to teach for justice and equality in a multicultural, social reconstructionist teacher education course. Action in Teacher Education, 18, 57-67. McCall, A. L. (1996). Making a difference: Integrating social problems and social action in the social studies curriculum. The Social Studies, 87, 203-209. McCall, A. L. (1996). Teaching by the rules, changing the rules in teacher education. Teacher Education Quarterly, 23, 143-152. McCall, A. L. (1995). Using literature in social studies. The Whole Idea, 5, 18-20. McCall, A. L. (1995). Constructing conceptions of multicultural teaching: Preservice teachers' life experiences and teacher education. Journal of Teacher Education,46, 340-350. McCall, A. L. (1995). The bureaucratic restraints to caring in schools. In D. M. Dunlap & P. A. Schmuck (Eds. ), Women leading in education. Albany, NY: State University of New York Press. McCall, A. L. (1995). We were cheated! Students' responses to a multicultural, social reconstructionist teacher education course. Equity & Excellence in Education, 27, 15-24. McCall, A. L. (1995). Pressures for silence, opportunities to speak: Teaching from a feminist perspective in teacher education. In R. Martin (Ed. ), Transforming the academy: Struggles and strategies for the advancement of women in higher education. Des Moines, IA: Greymill. McCall, A. L. (1994). Rejoicing and despairing: Dealing with feminist pedagogy in teacher education. Teaching Education, 6, 59-69. McCall, A. L. (1994). Including quilters' voices in the social studies curriculum. Social Studies and the Young Learner, 7, 10-14. McCall, A. L., Alatalo, J. & Tebay, J. (1994). Preparing teachers for more democratic schools: The possibilities of feminist pedagogy in teacher education. Democracy & Education, 8, 17-23. McCall, A. L. (1993). Can you hear me? Struggling to speak in feminist voices in teacher education. The Journal, 8, 8-18. McCall, A. L., Higgins, J., & Karrels, A. (1991). Infusing a communities unit with the concept of caring. Social Studies and the Young Learner, 4, 13-15. McCall, A. L. (1989). Care and nurturance in teaching: A case study. Journal of Teacher Education, 40, 39-44. McCall, A. L. (1988). The importance of caring and nurturance in teacher education. IATE Newsletter, 36, 1. Preparing Inclusive Practitioners: The Preparing Inclusive Practitioners project allowed six faculty from three different departments in the College of Education and Human Services to significantly change the third semester of the teacher education program for elementary majors. We collaborated in making connections among the content in math, science, and social studies methods courses, integrating content from ESL/bilingual education, special education, and instructional technology in the methods courses, and requiring additional teaching experiences for elementary education majors during their clinical teaching experience. The changes in professional semester three were precipitated by two factors: first, the recommendation of a College of Education and Human Services task force to revise the teacher education program, and second, the need to prepare our students to meet a new licensure requirement, the Teacher Performance Assessment (Ed TPA). Teaching Literacy in Social Studies: Substantially revise a graduate course, Elem Ed 726 Social Studies and Literacy, including an intensive study of literacy standards and best practices in teaching and assessing literacy and revise the Elem Ed 317 Teaching Social Studies PK-8 course to include appropriate literacy standards and best practices in teaching and assessing literacy within social studies for beginning teachers. Wisconsin Indian Textile Art: Study Ho-Chunk, Menominee, Oneida, and Ojibway beadwork and ribbonwork and create the pedagogical tool of a slide presentation for teaching about Wisconsin Indian history and culture through this textile art. Stitching Hmong History: Study Hmong textile art and create the pedagogical tool of a slide presentation to teach about Hmong history and culture as reflected in paj ntaub. Children's Literature and Social Action in Social Studies: The development of the pedagogical strategy of utilizing children's literature and social action projects to help students link knowledge with social action. Extending Scholarship on Exemplary State Studies Teaching: read to increase my knowledge of recommended practices in social studies education, studies of exemplary teaching, and research on factors which support outstanding teaching and those which impede it and prepared three manuscripts for publication based on my 2002-2003 research. One manuscript was written for elementary teachers in providing suggestions for improving state history. A second manuscript concentrated on university social studies educators and school administrators and suggested ways they could support exemplary teaching. Finally, a third manuscript was a research article for an audience of other university researchers describing the research process and main findings as a contribution to the body of knowledge on exemplary social studies teaching and factors which contribute to and impede such teaching. Studying Diversity To Improve Teaching And Prepare For New Research: Read extensively in the areas of women teachers' experiences in K-12 settings and higher education, pedagogy, an ethic of care, diversity due to gender, language, social class, race, and ethnicity, multicultural education to address diversity in the classroom, and new research approaches integrating autobiographical, feminist, and action research/teacher research. Developing Multicultural Curriculum in Preparation For Studying What Children Learn From Multicultural Curriculum: Development of four to six original multicultural curriculum units which integrate social constructivist and culturally compatible pedagogy with multicultural social studies and literacy (reading, writing, listening, and speaking) content. Do Preservice Teachers Use Recommended Practices in Clinical Experiences? The project's objectives were to: (1) Investigate which aspects of recommended social studies education practices preservice teachers applied in their clinical experience and the factors which influenced the preservice teachers to apply these recommended practices. (2) Investigate how preservice teachers modified their instructional materials, activities, and assessment methods to accommodate the diverse needs of the children in their clinical placement, including those with special learning and language needs. (3) Investigate the effects of preservice teachers’ social studies teaching on elementary students’ learning. The main findings were that a social studies methods course can influence preservice teachers’ practice if the preservice teachers understand and are committed to recommended social studies education practices advocated in the methods course, if they have opportunities to apply the ideas in their clinical experience as a result of their cooperating teacher’s encouragement or permission, and if they believe their students benefit from the recommended practices. Studying Exemplary Elementary Teaching of Wisconsin Studies. Document exemplary teaching of Wisconsin studies and depicting how four elementary teachers from different parts of the state met the challenges to teaching state history. Why Do Students Benefit From A Reduced Class Size Program? A collaborative effort with six teachers involved in the SAGE program at Webster Stanley Elementary School, Oshkosh, WI to document the teaching strategies, rigorous curriculum, grouping methods, assessment procedures, and family involvement activities SAGE teachers use in promoting their students’ academic achievement. What Do Children Learn From Multicultural Curriculum? Research the effects of teaching multicultural curriculum units in a fourth grade classroom on the academic achievement and attitudes of privileged students, girls of all groups, students of color, and low socioeconomic students.